Rated E for Everyone by the ESRB. Mario Kart Wii is the sixth game in this long-running franchise, which started on the SNES, and has been one of Nintendo\'s high profile releases since. While in many ways it is similar to its predecessors, in particular the N64 or DS iterations, there are changes in a few key areas which keep things fresh. 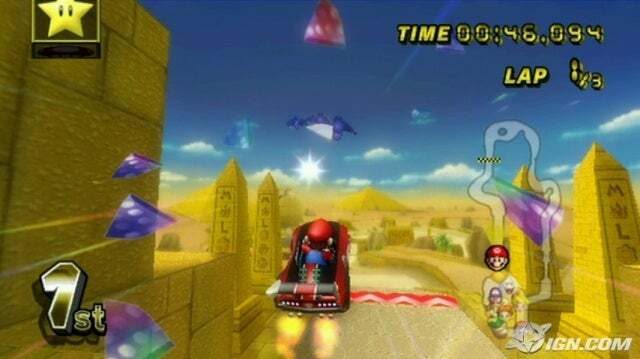 Not only can you drive with a controller like in previous entries, but you can also pick up the Wii Wheel, insert your Wii Remote, and really drive your way across the finish line. 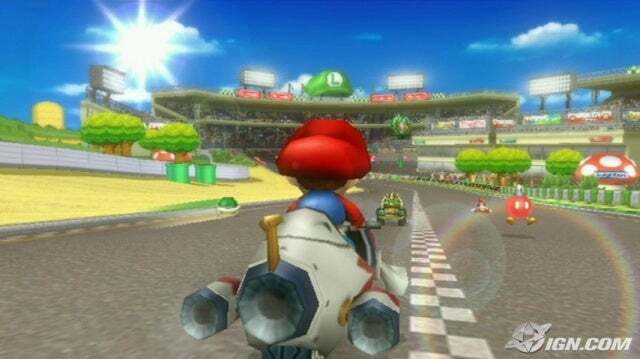 Another area important to Mario Kart Wii is the drifting mechanic. While going around a corner, you can press the jump button, and hold it down to drift into a turn. Depending on the vehicle, it can help you make turns that you could not make without drifting, and it has the added bonus that your speed does not decrease for the duration of the drift. New to this version is the Manual and Automatic modes. One of the big bonuses to drifting is that in addition to improved turning, you get mini turbos if you drift long enough; this is unlike previous versions where you had to alternate left and right quickly on your controller to activate the turbo. Now you just have to hold on to the drift, and once sparks appear by your wheels, let go of the drift button and off you go. However, all of this complexity can be difficult for certain drivers, so they added Automatic mode. While you may think this has something to do with gearing, there are no transmissions in Mario Kart. On Automatic drifting, you don\'t have to press the drift/jump button to drift. You simply turn sharper. Mini turbo boosts from drifting are disabled in this mode. This indeed makes turning much simpler, and can be advantageous at times over Manual drifting, though skilled drifters will still have the edge most of the time because of boosts. Any advantages most likely depend on the course and skill levels, as you might expect. Minibikes are a pretty big addition to Mario Kart Wii. While they seem pretty similar at first, their differences start to become apparent. First of all, bikes are lighter; as a result, they are much more likely to be knocked around when hit by another competitor. Just like previous games, karts can drift around corners for up to two different levels of boost: first the blue sparks, then the orange for a really big boost. This is also true for karts here. Bikes are limited to only one level of drift boost, but in return, they can do wheelies. Wheelies are performed by shaking the Wii Remote (or pressing the trick button on the GameCube/classic controller) and they give you a small boost when going straight. They are also really useful in that they keep your speed constant, so they can really improve the duration of a mushroom, drift boost, or other track boost if timed correctly. They are quite useful. To compensate, you cannot turn very much (only very slightly) while in a wheelie, and you are very vulnerable to being knocked over. Another interesting difference is that on certain bikes, you drift \'inside\' instead of \'outside\', like a kart does. What this means is that instead of sliding out into a turn where you start to turn more sharply, you immediately grip hard into the turn. This definitely changes the feel, but it fits my tastes and style quite well; bikes of this type are my preferred ride because you can turn much more sharply \'on a dime\' then any other vehicle/drifting combination. Bikes are not labeled as inside or outside drifters; if you experiment with the different kinds, you will see what I mean. Naturally, different courses (and driver styles) impact whether or not a bike or kart is best for a particular case. In my opinion, bikes require a bit more strategy, and as a result, I find them more fun to drive. There is quite a bit of course variety in Mario Kart Wii. There are sixteen new tracks, and sixteen retro tracks from the previous five games, totaling thirty two tracks. Not too shabby. There are some really great ones also, as well as a few duds - but the good greatly outweighs the bad. A few take quite a bit of practice to get down, like Mushroom Gorge and SNES Ghost Valley 2 (which I have come to love). Others, like Coconut Mall, or Moonview Highway, or N64 Bowser\'s Castle, or DS Delfino Plaza, or.. (there are many more) are just tons of fun. While one or two could have been better chosen (DS Yoshi Falls? Huh?) overall the track list really is great. There are many different characters available, which have a weight of light, medium, or heavy. Each weight class has different typical advantages or disadvantages. In this game, all characters of the same weight class use the same vehicles; so for example, Mario, Luigi, and Peach all have the same rides, except that the color scheme is different. What differentiates them is that each character has subtly different strengths and weaknesses. For example, some characters turn slightly sharper, while another goes slightly faster. This difference is not immediately obvious, but the more you play, the more you will notice. When viewing a kart\'s stats, the character that you are affects what is displayed, so some people online have figured out what the differences are. All I can say is that while this game is remarkably balanced, as always there are a few standout combinations in my opinion. However, unlike some previous games, these standouts are not so ridiculously unbalanced that everyone will be using the same few combinations, which goes to show how good of a job they did balancing things this time around. Depending on preferences and tastes, there are a lot of great racers to choose from. Many new karts and bikes can be unlocked as you play through the single player modes, and even play online. As for game modes, much is similar to previous entries. There is Grand Prix mode where you race each cup, and Time Trial where you try to get the fastest time possible on each track. For Grand Prix, there are several standard speeds: 50cc, 100cc, and 150cc. Each of these modes give the karts/bikes more power, and as a result, they go a lot faster. Also, 50cc is reserved for karts, and 100cc is reserved for bikes, though that opens up once you complete those levels. 150cc can use both. The AI gets a lot better in each successive speed grade as well. Eventually, you can unlock Mirror Mode, which flips each course around and makes things a lot harder, as the AI is as tough as it gets, all with 150cc speed. For Time Trial mode, you not only compete for the best time, but you can try to beat ghost racers made by Nintendo employees, and if you are fast enough, unlock fast ghost times - trials by the fastest Nintendo employees which can be hard to beat. In addition to this, you can submit your ghost times online, and complete against all of the best players around the globe. You can even race a rival ghost - someone who is only a little bit faster than you - as you try to get better and better. It\'s really great, and the online element really makes it rather addictive. For the multiplayer modes, there are several which return from previous games, the first of which is Battle Mode. This includes standard Balloon Battle where you try to pop your opponents\' balloons, and Coin Runners, where you try to collect coins around the track, and keep your opponents from theirs by knocking them out of their hands with shells; whoever has the most when time is up wins. There are also standard vs. races. These can all be played with up to four players locally, or twelve players online. It is this online play that is truly fantastic. Yes, Mario Kart DS has great online play, and is still very popular, but Mario Kart Wii has perfected it, as long as voice chat is not important to you (Nintendo does not want strangers to be able to contact children, so they do not add voice chat to their games). This is the first game where battle modes are available online, as well as the fun time trials mentioned above. There are also the above mentioned vs. modes. Up to two racers can use one Wii at a time, and competing online against others works amazingly well. I have never seen even the slightest evidence of lag whatsoever. All racetracks are available, and which is played next is chosen via a voting system. The only small gripe I have is that you can\'t change your vehicle without quitting out of WFC (Wi-Fi Connection) and reconnecting. Other than that, it\'s great fun. You can also \'text chat\' with one of many sets of preset text strings. This allows simple communication without allowing personal information to be shared. If fantastic online play was not enough, Nintendo has been implementing Tournaments. Every two weeks or so, they launch another tournament. Each one is typically a standard level with some twists that you have to overcome to get a good time trial. One level was particularly impressive in that the level was not available to play in outside of the tournament - I had never seen it before other then playing it in a tournament. Your tournament rankings are saved, and you can view your online rankings, as well as the best times of your friends, your region, and worldwide. You can also see what country they are from. I think it\'s a great system that really extends the replayability of Mario Kart Wii. Every few weeks I see my Wii glowing that \'new message blue\' and I know another tournament must be here. It\'s great incentive to keep playing. The gameplay and control responsiveness is really top notch. The Wii Wheel, while not quite as accurate as analog control, is quite remarkable for how well it works. While I do prefer the nunchuck controls for serious competitiveness, I was surprised to see how well Wii Wheel users can do online. Anyone who uses the wheel online will have a picture of a steering wheel next to their name, so you can tell their control scheme. I think it\'s a good idea, and it helps keep people honest. The graphics are really excellent. The framerate is butter-smooth 60fps, and I have never seen it dip, even with lots of people on the screen. The animations are really great, and each item thrown, banana dropped and slipped onto, or bob-omb exploded looks as good as ever, in the cartoony consistency you expect from Nintendo and Mario. Sound effects work equally well. Each slip, crash, and boom sound is what you would expect. Each race track has its own theme that does a good job setting the mood and keeping things fun. The voices are all what you expect, though I admit the Mii character\'s voice (at least the male one) is kind of dorky sounding, but it\'s not annoying. All in all, it\'s another high quality job. From a Christian standpoint, there is really almost nothing to complain about. There is vehicle violence in a cartoony, slapstick sense. There is no foul language, even online, since people cannot enter their own messages. There are ghost characters, called \'boos\', that are on a couple of stages, and you can unlock one to drive as. This is similar to other Mario games, and very cartoony, and nothing serious. There is no storyline - just a race to win. There is no sense of good or bad; even Bowser and Mario can race together with no feelings exchanged. It\'s a fun, lighthearted race that the whole family can enjoy. Mario Kart Wii is a really solid entry into one of Nintendo\'s most popular franchises. Though in some ways it does not completely top the fabulous DS entry, it is extremely well done and a ton of fun. I recommend this to any fan of any other Mario Kart game, or anyone who wants a fun, family friendly race with a little competition as koopa shells go flying. If that wasn\'t enough, the family can play together, even halfway across the world.